The clouds tonight are low, and moving fast, yet it doesn’t feel like there’s a lot of wind out there. That’s a little different than last night, when the wind and rain managed to wake me up at 1 in the morning. 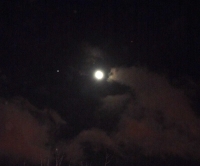 There is something wierd about how clouds move at night. Like there’s something of an invisible hand pushing them past the moon.